You can speak directly to your audience! Deliver information, products and services that meet your customers’ needs and wants. Simple: It’s the creation and distribution of content to a defined audience. Your content should attract and retain customer attention and lead the customer to action. I work with your staff to plan, create and maintain websites– including training for routine content updates. Here are a few examples of website projects. My role included project direction and content development with additional content development, implementation and web maintenance for one year following the site launch. The project benefitted from advance planning, input and contribution from a cross section of Bandon Chamber business members and board directors. Executive direction was provided by chamber director Julie Miller. Web programming and hosting provided by Tillamook Design. 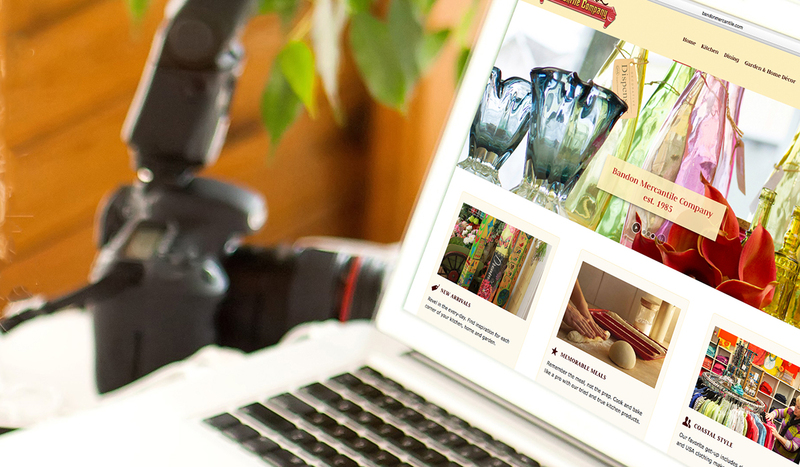 Bandon Mercantile Company owner Beth Wood needed a website to effectively showcase the services and products available at her business. She also wanted a digital platform to anchor her print and broadcast promotions and email marketing. Since the site launched, her email marketing list has grown more than 35% and maintained above average reader response: Open rates are approximately 20 percentage points higher than retail industry averages reported by multiple email marketing platforms. Beth has also seen an increase in queries from travel and lifestyle news editors and producers. My assignments have included preparation of programmer RFPs, initial project direction and content development with ongoing content development, implementation and email marketing. Website programming is provided by Watts Web Studio. Coast Community Health Center needed a new website to provide a comprehensive overview of their primary health care providers and services. The website was designed with special attention to tone and visual presentation consistent with their physical health center, easy reader navigation– and room to grow. The new website was part of the health center’s rebranding and community outreach initiative as the organization transitioned from a Rural Health Center to Federally Qualified Health Center, adopted a new business name and moved to a new health center location. Since the launch, the website’s content has expanded to reflect new services, a second office in Port Orford, and increase in health center staff. My assignments included preparation of programmer RFPs, initial project direction and content development; ongoing content development, implementation and email marketing; and CMS training for health center staff. Website programming is provided by Watts Web Studio.